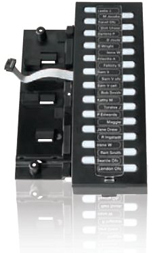 The Allworx Tx 92/24 Expander is the ideal solution for anyone who needs an array of one-touch features or the ability to monitor or route a high volume of calls directly from their phone. Up to three Tx Expander units can be anchored to any Allworx 9224 phone for an additional 24, 48, or 72 PFKs – offering you access to a total of 96 PFKs in one single integration. Each PFK on an Allworx Tx Expander can be programmed to perform a wide variety of functions which are activated at the simple touch of a button.